Maximilien Van Aertryck and Vincent Bitaud are two French filmmakers, though Maximilien is also half German and Vincent half Luxembourgish. They live in Paris and Stockholm and found each other working for Nisimazine (film e-magazine) during the Cannes Film Festival. Together they embarked on a very particular passenger ferry to make the short film Icebreakers, which premiered at the prestigious Visions du Réel festival in Switzerland. Vincent is also a photographer and Maximilien has made three short documentaries so far. 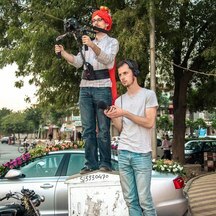 Together they have a common passion for the power of the moving image and want to make films that dare to explore new ways of narration and embark the viewers on journeys that will challenge their prejudices on our societies.